24 Hour Camel - Recovery Key Chain - Sobriety Keychains, Key Fobs, and 12 Step gifts! Truly a unique recovery key chain! The camel is a special symbol to members of Alcoholics Anonymous! 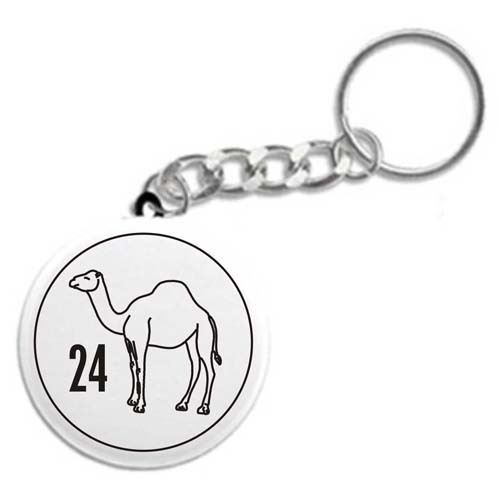 This button-style key chain features a familiar camel and the number "24" - representing the total number of hours we (and the camel) can go without a drink. The Camel teaches us spiritual principles: Prayer, Faith, Spirituality, and Sobriety - One Day At A Time! CAMEL PRAYER "The tasks of the day can pass with ease when a camel or I start on our knees. One Master we serve, the camel and I, and stay for that day completely dry." A special recovery key chain for anyone in the program! Excellent for newcomers and old timers alike! A wonderful alternative recovery gift for anyone in recovery!